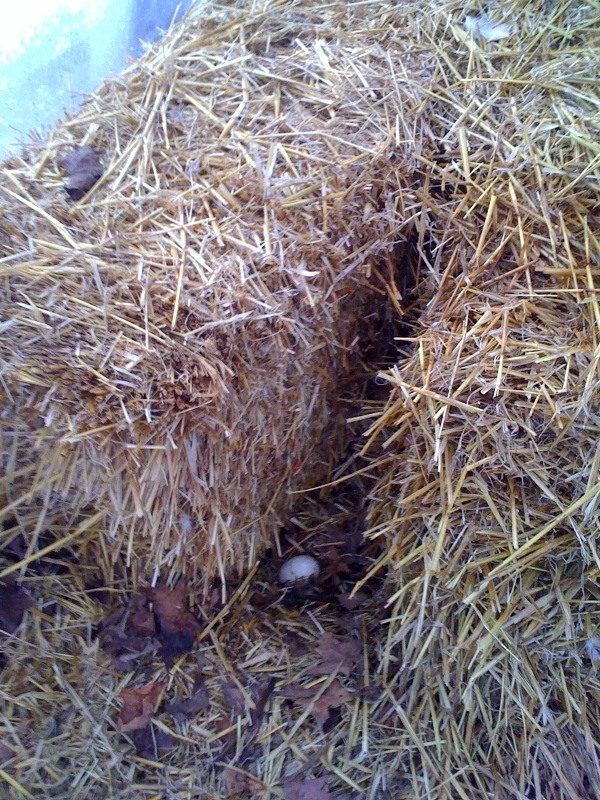 A month or two ago,feathers began to accumulate in the straw and leaf bedding, deposited by our two duckies who winter in the hoop house. That signalled the start of their spring molt and the promise of eggs. But first they needed to grow out their feather wardrobe for new fashion season. Only when they achieved that miraculous feat, could their little bodies begin the even more miraculous task of creating eggs. And this morning,at long last,I found the first egg of the season! It is as much a sign of spring as any green plant. We love our duck eggs. Rich,large-yolked,firm and flavorful,they make great omelets,frittatas and are perfect for baking. For a weekend brunch we like to bake duck eggs in ramekins. At the the bottom of each ramekin put a few tablespoons of sauteed leeks and mushrooms (great use of reconstituted wild mushrooms) and break an egg over top. Once baked to taste,between the oven and table,we add a touch of fragrant truffle oil. Yum! Daisy and Violet (Indian Runners) in their winter quarters. People often ask why we raise ducks rather than the more common practice of raising chickens. The short answer:I just love duckies for their intrinsic goofiness. The long answer: they do a great job of converting the readily available protein of slugs and grubs into eggs that we humans can better enjoy. They’re also easy to raise. 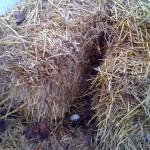 The main husbandry concern,as with chickens,is providing housing that protects them from predators. Every predator in the forest salivates for bit of duck fat and over the years we’ve lost too many of our little friends to foxes,raccoons and possibly even to hawks. Ducks don’t need to have a pond but we normally put out a kiddy pool or other low-rimmed containers for them to splash and play in. The resulting nutrient-rich “duck water”can be used for fertilizing the garden (avoiding any plants that will be eaten raw). Our ducks free-range when we’re at home. They can fly if necessary but normally stay within the bounds of our clearing. Since they are encouraged to forage for slugs in the garden, we must erect 12-18″fences around any beds with tender seedlings and those with lettuce or other tasty greens. Ducks will demolish most salad greens if given a chance. 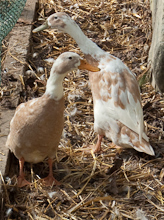 Indian Runners and Khaki Campbells that are bred for egg laying and not for meat, are the best foragers. They lay eggs almost daily from spring until late fall (usually with 4-6 weeks off for a summer molt) and are ravenous for slugs,worms and insects when producing eggs. In winter they don’t do much but have no trouble surviving even the coldest nights with nothing more than protection from wind and some dry bedding. Funny,hardy and useful. What more could you want from a fellow creature? 2 comments to First duck egg! Congratulations Faith —we’ve had all of the feathers,but no eggs yet. Thanks,Brian. Hope yours start soon too. Maybe they’re waiting to give you a little surprise for Easter!